A fifth of UK households are more than 3km from their nearest current account provider, finds Which? Santander will close 140 branches before the end of the year, wiping out a fifth of its network and putting more than 1,200 jobs at risk, it was announced today. The Spanish bank says it will ‘reshape’ its branch network in response to changes in how customers are choosing to carry out their banking. It will be hoping to lessen the blow by promising a £55 million upgrade to 100 remaining branches over the next two years. This latest news brings the total number of shuttered bank branches to at least 3,101 since 2015, following similar moves from Lloyds Banking Group and RBS Group last year. 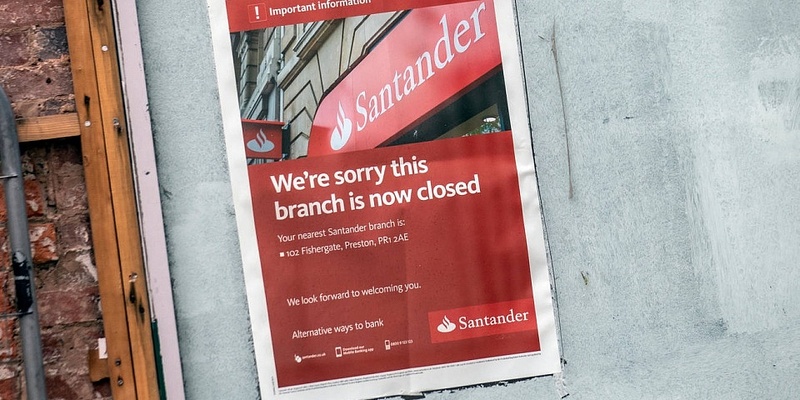 Keep reading to find the full list of Santander branches to be axed and use our interactive banking blackspots map of the UK to see the areas hit hardest by closures. Why is Santander closing a fifth of its branches? Which Santander branches are affected? Around the UK, the Santander network will fall to 614 branches over the course of 2019. The first cuts will start on 25 April when the following branches will close: Bathgate in West Lothian, Bideford in Devon, Clitheroe in Lancashire, Corby in Northamptonshire, Eastcote in Middlesex, Gracechurch Street in London, Haslemere in Surrey, Helensburgh in Dunbartonshire, Oakham in Leicestershire, and Queensway in London. In November 2018, exclusive Which? research revealed that a fifth of UK households live more than three kilometres from their nearest current account provider. Our map, below, reveals the areas hit the hardest by bank branch closures. You can also use our unique branch closure checker to find out which banks are shutting down branches in your local authority area. We estimate that the total number of physical bank branches in the UK has shrunk by nearly two thirds: from 20,583 branches in 1988 (according to parliamentary records) to 7,586 branches (relating to all current account providers) in 2018. Adding a further 140 Santander closures will bring that number to just 7,446. Under the Access to Banking Standard initiative, Santander must support customers in finding other ways to bank that best suit their needs. It must also publish impact assessments for each branch, detailing the reasons for closure and alternative ways to bank locally. Customers have been told they can use their nearest Post Office instead. But many people are doubtful that it can offer a suitable alternative to bricks-and-mortar banks. In an online survey of 2,049 British adults in September 2018, only 55% were aware that they can use a Post Office for banking, and 47% said they are unlikely to do so in the future. When we asked why they were reluctant to use the Post Office for banking, 59% said they simply prefer to deal directly with their bank. And 28% were worried about staff lacking expertise in financial services. Others voiced concerns that post offices have long queues (42%) and aren’t private enough to deal with personal finances (32%). With only 262 directly managed Crown branches left, an increasing number of Post Office branches are situated inside newsagents, convenience stores and retailers such as WH Smith. And the number of mobile outreach services – which are hosted in vans, village halls and local pubs for a few hours each week – has soared from 938 in 2010 to 1,518 in 2018. All Santander current and business account holders can use Post Office branches for basic banking services (you can check your account balance, withdraw cash, and pay in cash and cheques with a paying-in slip from your bank). But, many other services are unavailable. You can find out more in our investigation into whether the Post Office can plug the gap left by banks. Can the Post Office plug the gap as bank branches are shut down?